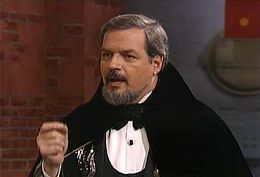 Harry Blackstone Jr. (June 30, 1934 – May 14, 1997) (shortened to Blackstone in conversation, referred to as the magician in the credits) was a famous magician who appeared on The Super Mario Bros. Super Show! In The Super Mario Bros. Super Show! live-action segment "Magician", Harry Blackstone Jr., after getting some fan mail from Luigi, sends him a response letter saying that he decided to visit him at Mario Brothers Plumbing. Arriving at the apartment in a puff of smoke, Harry Blackstone Jr. greets a surprised Luigi and asks him how his magic act was doing. Luigi responds to Harry Blackstone Jr.'s question by telling him that his act is doing pretty bad, as he cann't make anything disappear. Hearing this from Luigi, Harry Blackstone Jr. has Luigi demonstrate his disappearing trick for him; after placing a red cloth over a basketball Mario had been playing with, Luigi tries to make it vanish, only to fail. After this unsuccessful demonstration, Harry Blackstone Jr. tells Luigi that the magic words he is using are wrong and tells Luigi the real magic words. Now knowing the words used to make things vanish, Luigi says them and succeeds in making the basketball, and the cloth draped over it, disappear. Congratulating Luigi for making the basketball disappear, Harry Blackstone Jr. says to Mario and Luigi that he has to leave for a luncheon with Erik Estrada; before teleporting away though, Harry Blackstone Jr. warns Luigi to be careful with his new magic words. Later, Harry Blackstone Jr., having apparently been called by Luigi, returns to Mario Brothers Plumbing. When he arrives at the apartment, Harry Blackstone Jr. is told by Luigi that he had accidentally made Mario invisible and needs his help to return Mario to normal. After reprimanding Luigi on not being careful with his magic words, Harry Blackstone Jr. has Luigi repeat some new magic words after him; after Luigi repeats what Harry Blackstone Jr. said, Mario returns to normal. Upon being brought back to normalcy, Mario gratefully thanks Harry Blackstone Jr. This page was last edited on February 11, 2019, at 03:28.